So popular it became a business! 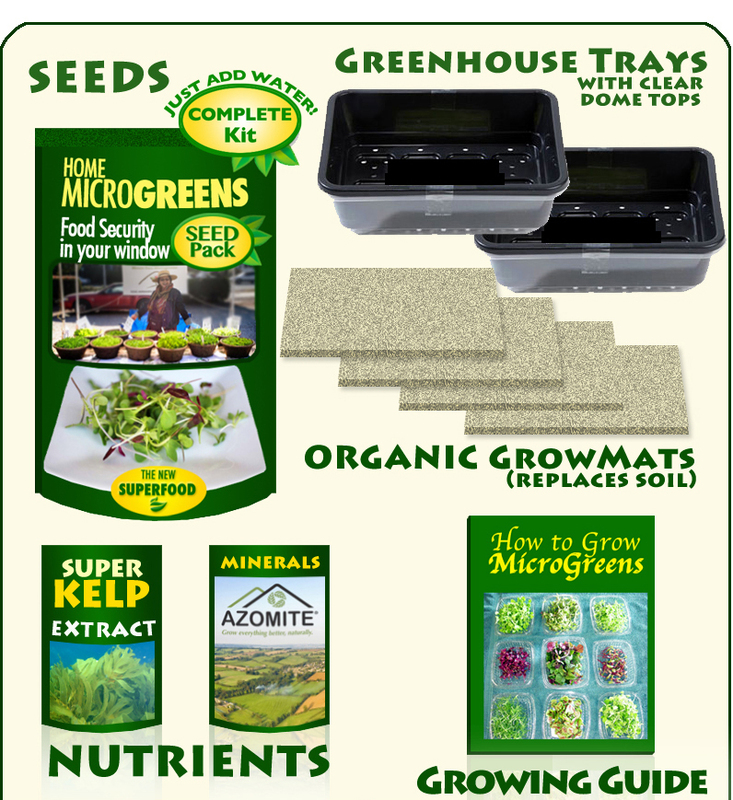 Order: Complete Home MicroGreens Kits. ready to eat in as little as 7 days! 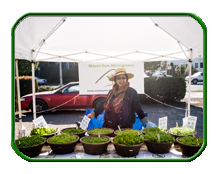 grow year-round in the CITY or COUNTRY! 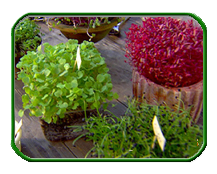 Our seeds are chosen by Square Foot Gardening EXPERTS for the best results in small-space, low-light gardening. 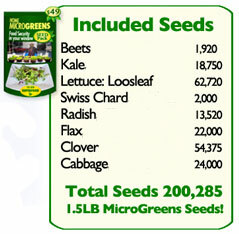 They are 100% Non-GMO, Non-Hybrid, Heirloom and are the freshest seeds from this years harvest. 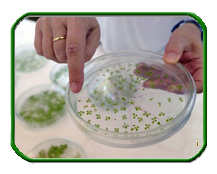 We provide the highest seed count for the money and prepare the seeds with USDA-developed moisture-reduction before hermetically sealing in air-tight, mylar pouches. & achieve food independence in 1 week! 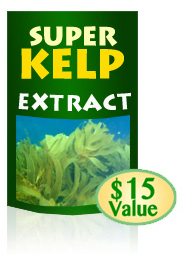 Norwegian KELP EXTRACT is a world famous organic source of naturally chelated nutrients. Vitamins, Minerals, Enzymes & MicroNutrients. 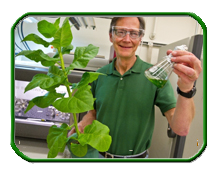 The healthier your growing medium the healthier your MicroGrenens will be. 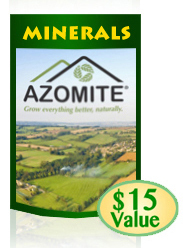 Mined from 30 million year old mineral deposit in Utah. 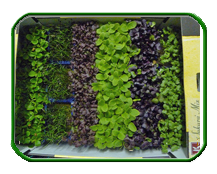 your MicroGreens reach maximum nutritional content with the right organic nutrient growing supplements. using a dome topped seed greenhouse produces higher yield from your seeds by creating a perfect "microclimate" for seed germination. 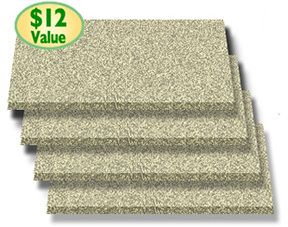 SEED TRAY DIMENSIONS: 10" x 10" x 4"
Compostable Organic Grow Mats provide a clean, fool-proof growing medium for maximum success with MicroGreens. No need for the mess and space needs of soil! 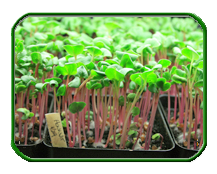 When used with Heirloom Organics MicroGreens Nutrients & Greenhouse Trays you will achieve bountiful success! 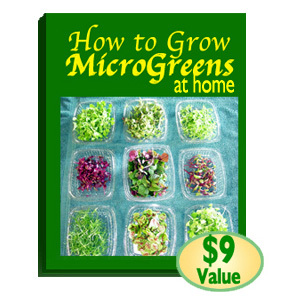 GROW MAT DIMENSIONS: 10" x 10" x ⅛"
Written by MicroGreens farming EXPERTS, the essential "How to Grow MicroGreens at Home" is the only book in print that teaches you the "How To of Indoor Security Gardening", "Create your own MicroGreens Garden in 7 Days" even "How to Start a MicroGreens Business" are included in this complete guide to MicroGreens. 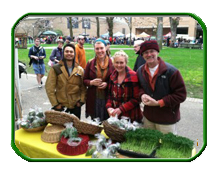 Buy TODAY and eat MicroGreens next week! 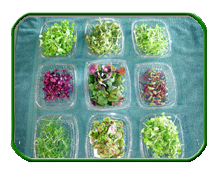 Microgreens Have Up to 40 Times More Vital Nutrients Than Mature Plants. 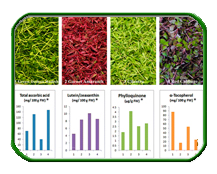 Scientists analyzed 25 different MicroGreens for nutritional content. 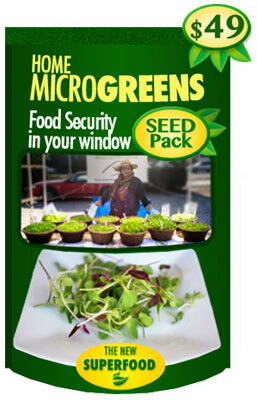 "Because microgreens are harvested right after germination, all the nutrients they need to grow are there. If they are harvested at the right time they are very concentrated with nutrients, and the flavor and texture is also good." Scientists found highly elevated levels of Vitamins C, A, K1, E and antioxidants. In some cases up to 40 times the concentration of fully grown vegetables. "All of these nutrients are extremely important for skin, eyes, and fighting cancer and have all sorts of benefits associated with them." - Researcher Gene Lester, PhD, of the USDA. 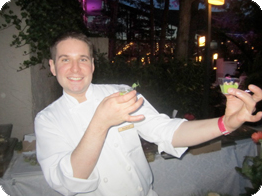 "We are recommending you guys to all of our prepping friends here in Utah. Your ethics and values should be more common among business in today's society. We wish your company the best success and thanks again for your great customer service." "Thank you so much! Everything looks great! Thanks and I will recommend you guys to everyone!" "I received in Canada exactly as you said I would with no problems at all. 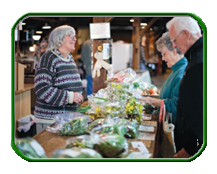 So glad to deal with our beautiful US neighbors...A happy Canadian, well done Heirloom Organics." 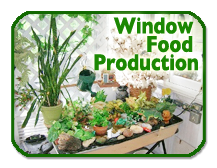 "Thanks for great service, great seeds and answering my Qs and patience too! Thanks!" QUESTION: How easy is this? I am not a gardener. ANSWER: Easier than making a sandwich! It's a simple, 3-step process with everything included. 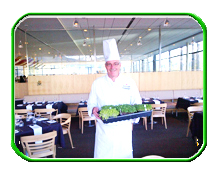 You spread the seeds in your tray and add water. When you see green, put the tray in the window. In 1-2 weeks you can harvest! Full instructions included. QUESTION: Is everything really included? ANSWER: Yes! all you need is water! QUESTION: Can I use some seeds now and store the rest for later? ANSWER: Yes, the seed pack is designed for that. Full instructions included. QUESTION: If I want to store my seeds, how long will they last? ANSWER: Because your seeds are prepared with the USDA-developed VAULT™ method of shelf-life extension, your seeds will last up to twice as long as they normally would. Kept in a cool place, your seeds will easily last 5-7 years with no loss of viability (gemination rate). 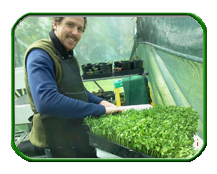 QUESTION:Someone mentioned that MicroGreens are a good business to go into, is that true? 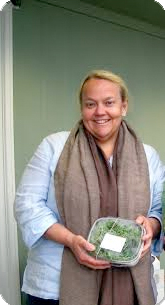 ANSWER: Yes, MicroGreens have become so popular at fine restaurants and in health-conscious homes that the market for them is growing exponentially. We recommend sharing your bumper crops with neighbors and friends to see! 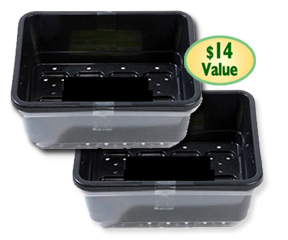 QUESTION: What if I want to grow more than 2 trays at a time? 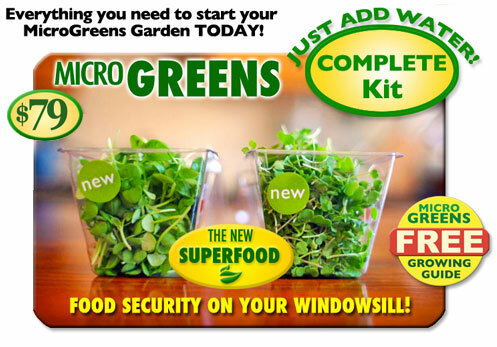 ANSWER: You can buy 2 Kits at a discount or get extra supplies in our MicroGreens Garden Store (link).